The genesis of the Southern California Blues did not take place in Orange County on pristine soccer fields. It did not begin with a gaggle of Academy players affectionately known as the Baby Blues, but instead on a bumpy field surrounded by oil pumps in the city of Wilmington. The year was 1985 and the team was the Under 19 Harbor City Bluejacks. The uniforms were not lime green, but were green with black shorts. The President of the Club was Bill Purcell and the manager was Brooke Jones (Yorba Linda). The coach, Tad Bobak (left), had more brown than gray in his beard. The soccer philosophy being taught was based around the 7 Elements. From the Bluejacks, the two-time state champions and perhaps the first "super-team" in Southern California girls club soccer, came the Los Angeles Blues Adult Women's Team. Coach Bobak, with the vision to see early on that women needed a place to play after leaving youth soccer, formed the Blues women's team in the spring of 1987. The LA Blues competed with much success in their Adult Ladies Soccer Organization (ALSO) League in Torrance along with their annual run at the U.S. Open Cup National Championship. 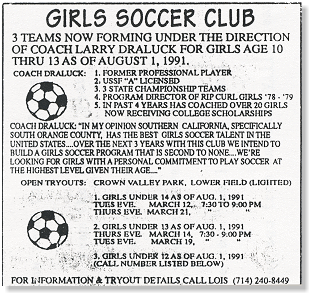 While Tad was busy with the Women's LA Blues and beginning his college coaching as UC Santa Barbara's Women's Soccer Coach, Larry Draluck was beginning his youth coaching at South Pasadena High School. Following a successful season Larry was invited to join the Olympic Development Program staff as CYSA-South's first ever Under 16 Coach. He was subsequently asked to help coach the next "super-team" in Southern California, The Southern California Nitemares along with Wayne Carver (Chino) where they won the next three state championships. Eventually Larry also joined the women's college coaching ranks landing a job at United States International University in San Diego as he continued his work in youth soccer with the San Diego Villa Bratz under coaching director Jerzy Szyndlar (San Diego). While winning another state championship with the Bratz and working at a summer soccer camp at UC Santa Barbara, Larry was given a group of girls to work with who hailed from South Orange County (San Juan Capistrano). Those girls were to form the foundation of the first Blues youth teams. In 1990 Larry Draluck (left), along with a handful of South Orange County parents took one youth soccer team called the San Juan Rip Curl and founded the San Juan Capistrano based youth soccer club, the Southern California Blues. The parents who met Larry at a UC Santa Barbara summer soccer camp and were instrumental in getting the club off the ground were Tom and Pat Lingo, Skip Jarvis, Bill and Lois Blodgett, Dave Gerhard and Mark Wels. Along with Larry and Tad each of these parents made huge contributions to the healthy formation of the Southern California Blues Soccer Club; Tom Lingo who owned several successful businesses in the area used his management skills to guide the club as it's first president while his wife Pat who designed clothing for Raisins Bathing Suits used her artistic designing skills to come up with the club logo and color set...thank you for your insight Pat. Bill and Lois Blodgett formed the club's first management team with Bill as the club's first treasurer and Lois managing many of the club's business affairs. Skip Jarvis helped Larry out with the coaching while Dave Gerhard and Mark Wels filled out the rest of the first Blues Board of Directors. The formation of the youth Blues was a revolution in Southern California youth soccer for girls and as revolutions go it was not without incident. The Coast Soccer League establishment at the time along with several of the league's administrators were not enthusiastic about a brash new club entering their league. Fearing the unknown, powers that were put many obstacles in the way to try and stop the formation of the Blues. Check out this amazing 1991 letter from the CSL registrar at the time explaining how we were in violation of competition rules and could be denied participation in the league. Eventually having broken no rules the league could not deny our acceptance and relented. Even back then in 91' rumors were wild as noted in the section one introduction of this historical document, the agenda of our first parent meeting. Worth noting also is section three which references how revolutionary we were having the first ever Player/Parent Agreement as a pillar of our club. Beginning with three teams and adding one additional team each season, Larry needed help coaching and began to assemble his coaching staff. The first staff coach was Rich Manning and soon there after in a major coup for the club, Larry convinced Tad to leave UC Santa Barbara and coach full-time with the Blues. In 1993 the LA Blues began their association and changed their name to the Southern California Adult Blues. Over the years, the youth girl's teams have been united with the women's adult team and each of the teams in the club wear the same uniforms and are coached in the same philosophy; the Seven Powerful Parts of Soccer. In 1994 Tad and Larry coached members of the original Blues under 18 team to the club's first CYSA-South state cup championship. There is a photo of this team along with those that have followed on the Blues Championship Photo page and in 2000 Bobak coached his under 16 girls to the club's first US Youth Soccer national championship. 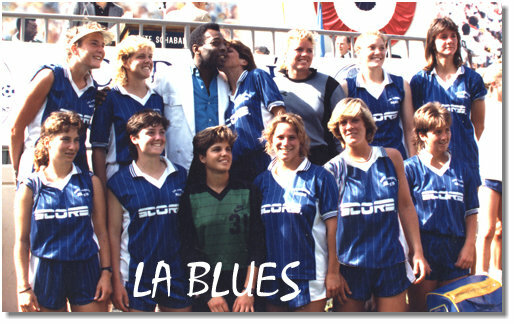 Since the birth of the Blues several famous players have worn the Blues colors including 1991 Women's World Cup MVP Carin Jennings-Garbara (86-87) pictured above in the LA Blues photo second from the right in the bottom row, U.S. Women's National Team co-captain Julie Foudy (87-88), UC Santa Barbara All-American and 1999 Women's World Cup star Laurie Hill (89-95), 1995 U.S. Women's World Cup Team member Jen Lalor (91-93) and U.S. Women's National Team Goalkeeper, Jen Branam (98-99, 2006). Having now grown to host 22 teams and over 330 players, The Southern California Blues continue to offer a tremendous environment for youth players who compete side-by-side with seasoned Blues senior players!